I know I should let the whole Big East thing go. I just can't. Irish Catholics are good at holding grudges. So every time something unfortunate happens to WVU, UConn and friends, I smile. Knowing that, you know I would enjoy this headline. Big East fans should not really care what one BC blogger thinks. The focus should be on their hapless Commissioner. Read the highly probably scenario Stewart Mandel spells out here. If Notre Dame struggles and Navy becomes bowl-eligible, good Big East teams will be scrambling for a bowl invite. Where is the leadership in Providence on that issue? In basketball news, Craig Smith is adjusting to NBA life and Troy Bell is making progress in his boxing career. Recruiting news: Brandon Brooks is not coming to BC. Way down below in the notes section of this report, there is a little blurb on TOB visiting Patriots camp. In this one article TOB points out the faulty logic of “returning starters” and then, in the very next sentence, places importance on experience. I think experience is important. However, it doesn’t trump talent. It doesn’t trump coaching and “returning starters” is a weak stat. For example: we are replacing two offensive linemen and two linebackers. That would seem to be a big worry. It’s not. Why? Because we have known, experienced players filling those voids. It doesn’t matter that they were not officially starters. They’ve seen enough action for me to feel comfortable. To further expose the weak correlation between returning starters and winning, take a look at the chart below. Our most recent and successful seasons included an experienced team and one that was relatively green. It didn’t really matter in the end. Kiwi signed with the Giants. Glad to see it. More NFL rookies have hurt their careers by holding out of their first camps. Kiwi's high school and college teammate Jeremy Trueblood finalized his deal with Tampa. Troy Bell is trying boxing. I love Troy, but this seems like a major waste of time. He could still make very good money in Europe. Why waste time and risk injury to start a boxing career at 25? Here's a nice feature on incoming Freshman Thomas Claiborne. More complaining about Boise. While some of these factors contributed to us heading to Idaho, players need to remember that losing to UNC allowed it to happen. Hopefully that will serve as a reminder/motivator this season. David Glenn with more on why the North Carolina schools struggle in football. I think he puts too much emphasis on the recruits per state. New Jersey has one of the best ratios in the country and Rutgers never wins. Recent grad Alex Fowler is entering the BC blogging mix. Pray for his health and sanity. Well now after telling Eagle Action earlier this year that he doesn’t regret sticking with Porter (eventhough it costs us games), he is finally coming around to admitting we blew a golden opportunity last season. We had the right schedule and plenty of talent. We just played the wrong people. This year could be big. We have the pieces. But TOB needs to learn from his mistakes because these after the fact confessions are getting really old. In other news, my adopted hometown is looking to add another bowl and include the ACC in the mix. While I hope BC is never the eighth most desirable ACC bowl team, I am excited that I won’t have to spend a lot of money to see BC play in a crappy bowl game. Our current out of conference slate is pretty weak. An upgrade may be coming. I’ve never been to Auburn, but I’ve heard it is worth the trip. Finally, EDSBS has part 2 of their Offensive Line piece. Another good read on the most overlooked area of the game. Conference meetings walk the line between useful event and boondoggle. There is plenty of golf and whatnot to keep the writers happy. It may not be the best use of time, but it does give the media a chance to talk to all the coaches and all the star players at once. This stuff can be good for game previews, features, building networks, etc. I can see why a small paper on a tight budget wouldn’t go. I can’t understand why the Globe doesn’t have someone there. The largest newspaper in New England apparently did not send its BC beat writer or its College Sports writer to one of the premiere conference meetings that included the only Boston team playing DI-A football. Who knows? Vega and Blaudschun might be there. Neither has filed. Inexcusable. The Herald did send Mike Shalin. He had a feature on the conference coaches validating BC and this notebook on the team. Things of note: Toal is healthy, Bell is not. One other piece of news: the Orange Bowl is now slotted for the ACC champion. Recruiting is not fun and not always on the up and up. Once again I like to think BC does the best it can given the climate. Current BC basketball commit Rakim Sanders is featured in this Globe series on college basketball recruiting. While there is nothing illegal going on, it doesn't seem like the best system now does it? Sometimes I think Mark Cuban is right and we should just go to the European model and start paying kids in diapers. ACC meetings are underway and as expected, the bowls remain the focus. The new plan is very close to what I predicted. Bowls will have choice, but record will factor in. Bottom line: with our travel rep the only way BC is going to avoid the lower-tier bowls is by winning our way in. Fortunately team seems as tired by their current plateau as I am. Beekman and Glasper were our reps at the conference meetings, another sign that both could be captains this year. John Swofford gave a Q&A to the News & Observer. Important to note: the revenue generated by the new conference continues to grow. Finally, former Heights writer Kevin Armstrong used his new spot at the NY Post to feature his alma mater. Here is an article on Preston Murphy and his path to Al's staff. Even with most of his stuff on ESPN.com, Kenpom still does a good job with his free blog. He is now going to write a comprehensive preview of one conference. The choice is ours, so if you would like to see what he digs up on the ACC vote now. The Big East currently leads. Here is a look at college teams and how their preseason rating corresponds to their actual results. Since 1989, BC has been consistently underrated. Finally this article speculates on what BC might do with the old Cardinal residence that we acquired as part of the seminary purchase. An Alumni Club wouldn't bother me. Regadless, I expect that BC will be respectful in whatever they do with the place. Since New England does not produce much football talent it is always disappointing when a local boy gets away. Sometimes the staff doesn’t think much of the kid and sometimes we just strike out in recruiting him. However, occasionally you dodge a bullet when the recruits you lose end up as losers themselves. Example 1: Duke QB and Mass product Zack Asack getting suspended for a year due to plagiarism. Example 2: CT boys James Nixon and Bruce Campbell heading to Fork Union Academy after failing to meet NCAA qualifying standards. Now I would have been happy if any of these guys has signed with BC. Just as I am happy now that we didn’t waste scholarships on them. Funny how that works. Credit to the Eagle Insider posters for finding these stories. Chris's Blog has quickly become one of my favorites. His takes are usually fresh and almost always funny. While following DC teams and kicking ARod and Michelle Wie when they are down are his specialty, he is also the only blogger I know with any Wake Forest knowledge. In the second part of my Summer Assessment Series, Chris tells us what we need to know about future opponent and annual heart attack game, Wake Forest. 1. What is the one thing that all the experts have wrong about this year’s Wake Forest team? Chris's Sports Blog: The loss of Chris Barclay won't hurt as much as expected. In 2005 the senior RB became the first Wake Forest player to win the ACC's Offensive Player of the Year Award since 1979, so it would seem natural that his graduation would cripple a team that has had limited success over the past, oh, millennium. But Barclay, for as good as he was, always was more of a system runner. Just like any running back in the Denver Broncos backfield is nearly guaranteed a 1,000 yard season, Jim Grobe's ground-attack gives opportunities for big seasons to players that would languish deep on the depth charts of other ACC schools. (This is not to suggest the Deacs o-line is anything like the Broncos; for one thing they don't cheat nearly as much, but that's a topic for another day.) Let's just say that it's not coincidence Barclay went undrafted. Without the reigning POY, junior Micah Andrews will carry the load for Wake. In the 2005 opener Barclay sat out because of a suspension and Andrews nearly set a school record in his stead, rushing for 254 yards against a solid Vanderbilt team. Andrews won't win POY honors, but the Deacs rushing attack should be fine in his hands. 2. The team struggled last year when Mauk started. Any reason to think things will be different this year? Chris's Sports Blog: Not really. Mauk was Jim Grobe's most heavily hyped recruit after setting national records as a high school quarterback in Ohio. But ever since he threw an 85-yard TD pass on his first throw in college, Mauk has been a relative disappointment. He looks and acts the part, but has always been mistake-prone when he's on the field. Perhaps the graduation of Cory Randolph will help though. After starting the first few games in '05, Mauk was pulled for the senior and didn't get back on the field until an injury forced Randolph to the sidelines. It's possible that without a reason to look over his shoulder (Mauk's backups will be redshirt freshmen), the junior QB will be able to shine with a longer leash. 3. Everyone in the ACC thinks highly of Grobe, but what do Wake fans think? Is there any frustration with the whole “he gets a lot out of his talent, but they still lose” mentality? Chris's Sports Blog: The Jim Grobe lovefest has always been a bit baffling, not because Grobe's a bad coach but because he really hasn't done all that much at Wake to deserve such praise. After a promising start in 2001, Grobe led the Deacs to a bowl victory in 2002. Wake finished 7-6 that year, but lost three winnable games in the final seconds. After that season, the "Grobe is great" chatter began and it was widely assumed he would leave Wake Forest for a better job within the year. Expectations were high in 2003, but the team struggled, bottoming out in a 51-17 loss to Division I-A newbie Connecticut. It was more of the same in '04 and '05; the Deacs would win close games against good opponents (BC in '04, NCSU and Clemson the following season) but couldn't close out the likes of Vanderbilt and North Carolina. It's clear Grobe is a good program builder, but his end-of-game strategies have always been baffling. Too many times Wake lets the clock run down during the two-minute drill, or calls for a running play on 4th and 2 when a pass is clearly needed. At some point the 'bad luck' argument fades and it becomes clear that the Deacs lose close games for a reason. Having a successful football team at Wake Forest is difficult. Beyond Brian's Song there is no football history at the school, the university has the smallest enrollment of all BCS schools and has a suburban campus, making recruiting against Florida teams and schools located near cities (hello, BC) extremely difficult. So, in that regard, Grobe has done well just having the Deacs competitive. At some point, however, the team has to take the next step; the "next step" being consistent presence in the postseason. It's nice that ACC schools don't regard Wake as a pushover anymore, but that's not Grobe's ultimate goal. He wants to be a perennial contender for a bowl game and maybe sneak in an upset or two. This will be Grobe's sixth year in Winston-Salem. Nobody realistically expected him to be there longer than three. It's not by choice. Had the Deacs lived up to expectations in 2003, Grobe would be on a sideline somewhere else. But those teams failed, much as Grobe has. Like I said earlier, Wake is no longer a doormat, but at least there's some pride in being a doormat. Seasons that begin with high expectations and end with records of 4-7 are just plain depressing. 4. The last three BC-Wake games have come down to the final two minutes? Care to make a premature prediction about this year’s game? Chris's Sports Blog: Down 20 with 3:00 left to play, Wake will score two quick TDs and recover an onside kick down six points. Holding all three timeouts, the team will get down to the Eagles one-yard line and have four shots to get in the endzone in the game's final 19 seconds. After calling for three consecutive fullback smashes that go nowhere and using all three timeouts, Grobe's team will face a do-or-die 4th and goal from the one-inch line. Grobe will instruct Ben Mauk to lineup in a shotgun, whereupon he will promptly get sacked for a 47-yard loss. Check out Chris's Sports Blog for a litte more on Wake and a lot more on the Redskins. The ACC Football meetings are just around the corner and the big news will surely be the new Bowl alignments and agreements. BC should be the focal point since our experience of getting passed over and sent to Boise is driving the new deal. Nothing has been announced but I am making a prediction on how it will work. And sorry BC fans, this doesn’t mean we will avoid San Fran, Boise and Nashville in the future. 1. The Bowls will still have a choice. This just makes good sense. The ACC wouldn’t be much of a partner if it forced teams on bowls. The bowls need ticket money to sustain their existence and lousy matchups will kill a bowl. Plus as attractive as the ACC might be now, there are plenty of other conferences that would gladly swoop in and agree to anything the bowls want. 2. Look for some sort of provision regarding conference record. This is similar to what we had in the Big East. This format allows the bowls to pick a team with a worse conference record than another eligible team as long as they are no more than a game behind the neglected team in the standings. For example, the Charlotte Bowl could not have passed on BC or Georgia Tech (both 5-3 in conference) last year to take NC State (3-5 in conference). However, Orlando selecting Clemson (4-4) over BC would have been acceptable. 3. There will still be backroom dealing. As we know, this is what the ACC does best. The ACC is a good partner and wants to bowls and the teams to be excited about their games. So reviewing last year’s scenarios, I can assure you that the ACC would have done something to get a regional team to Charlotte. If it couldn’t place NC State there, they probably would have positioned Clemson into the game. It just makes sense. The backroom dealing will also be very important with the Gator Bowl-ACC Championship challenges. Despite their success hosting Virginia Tech twice last season, I don’t think there will be many years where the Gator Bowl will want the loser of the ACC Championship game to return three weeks later. With the two divisions it is highly probably that there will always be a desirable team available to “swap” their bowl slot into the Gator Bowl in place of the ACC Championship game loser. Boise is now the slot for the Eighth place team, so anyone who ends up there won’t have much to complain about. I don’t think this will change BC’s fate, but it will be a little more protection. As I said over the next five years I think you’ll see BC in San Fran and Boise more often than you will see them in Atlanta, Orlando or Jacksonville. More previews are rolling out. You can read Athlon's abbreviated version here via SI.com. Most of ESPN's Blue Ribbon previews are Insider only. Fortunately for us they are giving away access to the BC version. Here is a nice article on another one of our Offensive Line commits. BC received another much needed OL commit over the weekend. Arthur Ray Jr. comes from a strong program and had some good offers from which to choose. BC rightie Terry Doyle threw a no-hitter in the Cape League this weekend. Here is a write up on another BC OL commit, Thayer's Nathan Richman. Blackmon signed his deal with the Packers. When Auburn finished just behind BC (fourth overall) in the N.C.A.A.’s new rankings of student athletes’ academic progress, most were surprised. The school has never been known for its scholar football players. Now we have a better understanding of a factor in the school's recent academic success. Jocks get away with a lot in college (and often get into schools they otherwise don't belong). It has been going on for decades and always takes a little bit of the fun out of collegiate athletics (for me, anyway). I’d like to think that if everything went professional and we gave up the sham of student athletes these things would go away. Unfortunately they won’t. There’s cheating at every level of sport. Even if colleges dropped all athletic scholarships and just put together local club teams, someone would still find a ringer or employ some illegal gimmick. And not to say BC is above it all. There are certainly guys who wouldn’t get in if they couldn’t play a sport. And there are certain classes that are much easier than others. Yet, BC makes these guys and girls go to class and will sit them if they don’t follow the school rules. We’re not perfect, but I do take pride in my school doing things right and better than most. Like last year, this offseason I will roll out a series of position reports to give you my analysis, expectations and hopefully point out something you did not know. This installment covers the Defensive Backs. (Read Part I: WRs and TEs here, and Part II: Running Backs here, Part III: Defensive Line here, Part IV: Special Teams here, Part V: Linebackers here, Part VI: Quarterbacks here, Part VII: Offensive Line here). The BC Secondary is often the victim of design. Let me explain. Last season we ranked 9th in the ACC in passing. You would figure that this meant our guys couldn’t hang in the new conference. Not exactly. The ranking is driven by yards allowed in the air, for which BC allowed 217 a game (in conference). However, the guys only allowed 2.9 yards per catch -- tied for 3rd in the conference. This speaks to the bend but don’t break philosophy. Spaz asks the guys to play soft coverage but swarm the ball as soon as it is caught. Teams will dink and dunk on us up and down the field (the high pass yardage allowed), yet we play the odds that the drives will stall out and we will avoid the big play and score. It works well, for the most part. Hence when ranking the units Athlon and The Sporting News both picked our defensive backs as 3rd overall in the ACC. The unit loses only one key contributor from last year (one of my favorites Jazzmen Williams). Into his corner spot steps Larry Anam. Anam is a converted safety who has had a few moments in the starting lineup. I often felt he looked lost out there and was a poor tackler. The move to corner should help since his assignments will be simpler (and in Larry’s defense he did improve his tackling last season). The heart of the secondary is our two outstanding safeties: Jamie Silva and Ryan Glasper. Silva is nearly a fourth linebacker as he is quick to support the run and led the team in tackles. Glasper doesn’t get much pub but is very solid. These two play very well together and have good instincts. In fact the only game last year where they seemed out of sync was the bowl in Boise. The other corner spot goes to Dejuan Tribble. Tribble is one of the most talented guys on the team. He had a bit of a sophomore slump and some have wondered if he is too restricted by our system (which puts in the corners in a lot of soft zones). I expect a big year (and no move to WR in his senior season). The second team guys are a little more of a question mark. The secondary did not substitute nearly as often as the D-line and LBs did last season. Mueller and Anderson have looked adequate in their limited time. I’ve heard great things about Razzie Smith although he has never played a down. Taji Morris showed improvement through the season. Still, none of these guys are known commodities. Hopefully they will get worked in and prove themselves. There is probably more speed in the secondary than we’ve had in years. Tribble can run with anyone in the ACC and Anam provides good size for a corner (now if he can just put it all together). The secondary lost two of its biggest friends in Kiwi and Ray Henderson. Kiwi sparked the rush on passing downs and Henderson was practically a third safety on passing downs. Those voides will hurt almost as much as Williams. However, the group is experienced and talented and should really come into its own this season. Chris Collins signed with the Bruins. Here is a nice article from his hometown paper. Here is a follow up from the same paper on Collins and his connection with Stephen Gionta. An Albany paper rehashes Josh Beekman's accolades. BC grad Ed McLaughlin was named AD at Niagara. He becomes the youngest AD in the country. BC target Stephen Garcia made ESPN's Top 150 list. The article also mentions recent commit Michael Peterson. Jackie MacMullan wrote a nice article on incoming Freshman basketball player and American Idol semi-finalist Ayla Brown. This is just the first of what will surely be a huge wave of media attention for a female basketball player. Brown seemed pretty poised during Idol, so I am sure she will handle the attention well. Preview magazines don’t cover everything. National analysts can often be wrong. So who do you turn to when you want to get real scoop on an opponent? Answer: a fellow fan. In an effort to fill these dog days of summer with a few morsels of information, I’ve asked Peter from Tiger Pundit to give us a quick take on Clemson. What is the one thing the experts have wrong about this year's Clemson team? PF from Tiger Pundit: A lot of experts are expecting our defense to be as good as last year's, but losing a player like Tye Hill is a big loss. Teams may be able to pass on us a little more than they did last year. Then again, running against us could be very tough. Our linebackers, led by Anthony Waters, are excellent, and defensive end Gaines Adams is projected to be a first-round draft pick. You have a lot of returning parts on offense including a second year with Offensive Coordinator Spence, yet will have a new QB. What do you think will give? PF from Tiger Pundit: Hmmm. Well, I hope this doesn't come across the wrong way, but I don't really think anything will "give." Spence has made a name for himself already, we have all five starters back on the offensive line (according to the Clemson spring football media guide, we're a combined 39-9 all time in the four seasons when we've had all five starters back on the line), and QB Will Proctor is not completely inexperienced: He had nearly 300 yards passing last year in limited playing time and led the Tigers to a victory in last year's season opener against Texas A&M after Charlie Whitehurst got hurt. Proctor also started and led the way to a victory over Duke. But with ACC Freshman of the Year James Davis, tough runner Reggie Merriweather and freshman-superstar-in-the-making C.J. Spiller joining him in the backfield, Proctor may be more valuable as a field manager than someone we'll absolutely need to get a win. (That's a theory I've seen floated in some preseason stories.) Then again, he'll have some talented and experienced receivers to throw to (Chansi Stuckey, Aaron Kelly, Rendrick Taylor -- who is a monster and a hell of an athlete -- and Tyler Grisham). Clemson is in most Top 25s and listed as sleeper to win the conference. What are your expectations for the season? PF from Tiger Pundit: For the first time in quite a while, I am really optimistic about the season. I don't see us losing more than two games this year. Then again, I've felt this way about a couple of other Tommy Bowden teams and been severely disappointed. But it really feels like all the pieces are in place for a good season. Finally, do you think Clemson will beat BC this year? PF from Tiger Pundit: Don't hate me, but I think we will beat the Eagles this year. I'm expecting a tough, close game, though. For more information on Clemson, please check out Tiger Pundit. The belief is Boston only cares about the Red Sox. The Old Towne team is the 800-pound gorilla in the market place, but the Hub is a huge region, with passionate people and diverse tastes. So next time you hear people say Boston doesn’t care about BC, don’t believe it. Look at BC’s TV ratings. They are great for a supposed under the radar team. 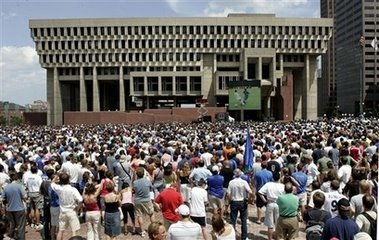 Yesterday was another reminder of how Boston fans will turn out for a good show and a winner. If BC were to break through and win something real (real conference, real bowl, etc. ), it would be big in Boston. Real big. Very nice feature on BC's summer strength and condition program on ESPN.com. Be sure to check out the video package that includes interviews with Marten, Silva and Ryan. In other news BC was named host for the 2009 NCAA regional to be held at the Garden. Like last year, this offseason I will roll out a series of position reports to give you my analysis, expectations and hopefully point out something you did not know. This installment covers the Offensive Line. (Read Part I: WRs and TEs here, and Part II: Running Backs here, Part III: Defensive Line here, Part IV: Special Teams here, Part V: Linebackers here, Part VI: Quarterbacks here). Despite losing two starters to the NFL, the offensive line should be the strength of the team. All three returning starters made various preseason All-ACC and All-America teams. In my opinion Beekman was the team's best player last year and this year Beekman and Cherilus might make up the best right side in the country. Marten is a very solid performer and should make an NFL roster one day. After auditioning at other positions, it looks like he will return to left guard. This is good. If the new cogs struggle, he may end up at Left Tackle (but I doubt it). The only positions with any question marks are Left Tackle and Center. After a competitive Spring it looks like the new starters will be Kevin Sheridan (C) and Ryan Poles (LT). Both have plenty of in-game experience. The Line has been the foundation of TOB’s success and I really don’t expect any drop off in the overall performance of the unit this year. The big guys are consistently evaluated well as recruits, coached well on campus and given schemes in which they succeed. Offensive line play is tricky and we do it better than most. Credit to TOB and position coach Horton. Like last year, the second team guys should see some playing time. Hall, Sheil, Huggins and Avenski will all be in the mix. If either Poles or Sheridan struggle, Hall is the most likely candidate to become a starter. In 2004 BC replaced three starters (Hoffman, Snee, and Leavitt). It could be argued that the new guys played better than their predecessors. There is no reason Poles and Sheridan could not outshine Trueblood and Ross, like Beekman, Marten and Cherilus did when they became starters in 2004. Trueblood and Ross were very good. Both are going to play in the NFL. However, Beekman, Cherilus and Marten had better seasons last year. After rewatching and grading all the games, I felt our returnees were more consistent than our future pros. I hope that explains why I have no worries about our Offensive Line performance. I can be very critical of TOB, but he has earned plenty of slack when it comes to this unit. The "Offensive Line U" thing might not last forever, but it will not come apart this year. As much as we try to play down our ties to illegal sports betting, there are still plenty of BC fans who like to wager a buck or two on the Eagles. So credit goes to Wizard of Odds for noting the opening lines. Since we kick off the season, we are the first game posted. Currently BC is a 14-point favorite at CMU. I haven’t done my CMU research yet, but I don’t like us giving up that much in our opener (always a shaky game for BC) and on the road. Anyone remember Ball State in 2004? Despite its happy ending for BC, the Big East defection/ACC expansion was a public relations mess. Problems arose when the politicians got involved. One of the biggest grandstanders was Connecticut Attorney General Richard Blumenthal. He turned Miami, Syracuse, and BC’s reasonable decision into his own personal crusade and claimed that the departing schools had duped the Connecticut tax payers and UConn. Well, we know how it ended. Now Blumenthal is up for reelection and one of his challengers is wisely reminding voters how much time and money this gasbag wasted. I wished I lived in CT just so I could vote against Blumenthal. Summer is pretty slow for college sports. Your only options are to eagerly await the preview magazines or throw yourself into recruiting news. I like the preview mags, but tend to avoid the recruiting news. I’ll still keep tabs on BC’s commits (and so far the school is doing pretty well), but I try not to get overly excited about who is coming to BC and what they promise to do. I learned my lesson long ago. In fact if you just say the phrase “Hinds and Crosson” most BC fans will know exactly how I feel. BC fans were often left out of recruiting news. Our players weren’t featured in Parade. You couldn’t call Tom Lemming’s hotline and hear about anyone going to BC. That all changed with the internet. Suddenly BC fans could follow the comings and goings of our recruits just like the big guys. After a few seasons of hype (fed by Mike Farrell and former recruiting coordinator Al Golden) BC fans finally felt like they landed two can’t miss guys in Justin Hinds and Anthony Crosson. The two big New Jersey lineman were supposed to change BC football. Instantly dominate. Turn BC into an elite power. No one questioned if these guys were overrated. No one challenged Farrell’s bias or potential conflicts of interest. These guys were the foundation. Two to build around. What happened? Nothing. The two can’t-miss kids barely hit the field. Injuries, attitudes, effort (or lack their of) all contributed to Hinds and Crosson’s disappointing careers. BC wasn’t the first group of fans to face a blue chip letdown. This was just our highest profile bust(s) of the internet age. I learned my lesson. I never pay for recruiting news and don’t count on anyone until they reach campus and actually hit the field. I don’t think much of Mike Farrell’s writing (but I am not alone there) or his rankings. There are enough highs and lows involved with following BC, that you don’t need to waste your emotions on the comings and goings of high school kids. Recruiting is vital to a program's success. However, you should judge a class after their senior year of college, not their senior year of high school.